The Mercer County District Library's Book Discussion Group. 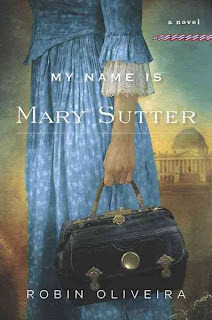 In this stunning first novel, Mary Sutter is a brilliant, head­strong midwife from Albany, New York, who dreams of becoming a surgeon. Determined to overcome the prejudices against women in medicine-and eager to run away from her recent heartbreak- Mary leaves home and travels to Washington, D.C. to help tend the legions of Civil War wounded. Rich in historical detail and full of the tragedies and challenges of wartime, My Name is Mary Sutter is an exceptional novel. Robin Oliveria has created a truly unforgettable heroine whose unwavering determination and vulnerability will resonate with readers everywhere.